Singaporeans have learned to take Lee Kuan Yew's (李光耀) declarations with a profound sense of pragmatism. It's then all the more surprising to see him saying that Hu JIntao (胡錦濤), according to cables released by Wikileaks, Hu is a patient man and will wait 10, 20, 30 years for Taiwan "return" to China. On second thought, he explains these 30 years could be 40 or 50 years. Maybe he was talking about Singapore's opposition party being at the head of the government in Singapore. We even learned, according to Lee, that China's goal is not reunification! Its real policy is to prevent Taiwan's independence and then "bring back" Taiwan to China. He probably thinks that after 50 years of separation from China, on top of the 111 years that Taiwan has been growing separately from China since 1895, Taiwan might still be waiting, like a long lost bride, to be reunited with China. Lee might do well to remember Singapore's history when he practically cried over Singapore being imposed partition from Malaysia. Do Singaporeans now want to be reunited with Malaysia? 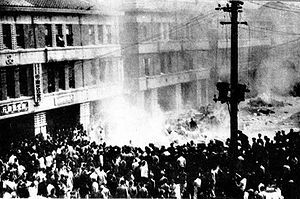 The 1964 Kallang Riots might not be talked about every day in Singapore but they are as painful as the 28th of February in Taiwan. Maybe China could follow Malaysia's example when on August 7, 1965, it expelled Singapore from the Malaysian Federation. One of the few cases, if not the only one, when a country was forced to become independent. I wonder whether some Chinese leaders have ever considered it in some cables sent by negotiators that led to the Consensus of 1992 九二共識 that both countries, Taiwan and China, agreed on unification but also accepted that each country had its own interpretation of unification.